Grandma J likes to spend quality one-on-one time with her grandchildren. But some get more than their share of Grandma J's time due to circumstances beyond their control. Like Elise.....because she only goes to her school one morning a week. That doesn't mean she doesn't have a full schedule that requires meals on the run. 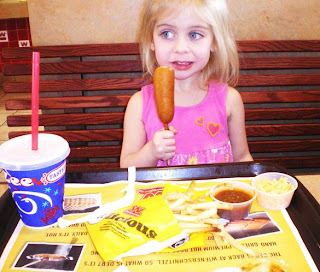 Like the day Grandma J took her to Der Weinerschnitzel because Grandma J doesn't have one in Texas it's a good thing to have some variety in your diet. 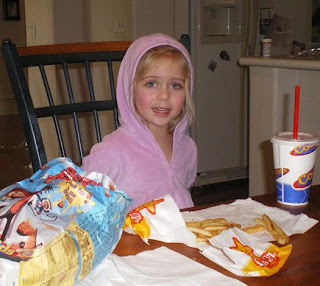 But when Elise places her order, she asks for chili fries with the chili and cheese "on the side".....and we weren't happy with the way it came. 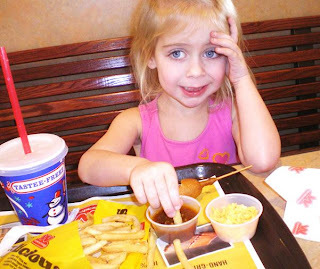 Elise said she could dip her fries in the chile, but not the cheese. You can't go wrong with McD's. Well, unless they give you a boy toy with your Happy Meal. Can Grandma J get a boy toy please? Let's move on to Arby's where the curly fries were a big hit. So, I'm sure all three of you are counting your blessing that your children aren't subjected to such nutritional abuse. All Grandma J can say is, don't be so sure. Besides, Elise burns off all those empty calories in no time flat. 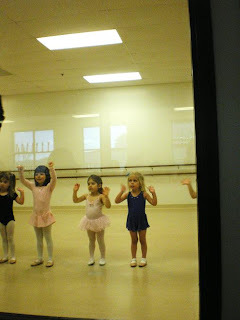 There's the ballet lessons. It's a shame that Grandma J has to take pictures through a two way mirror. 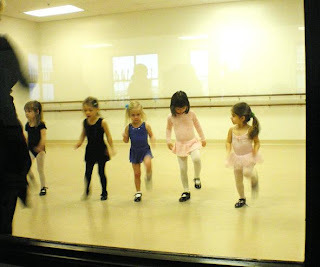 And, the tap lessons that look like the ballet lessons but with different shoes. 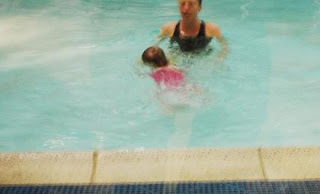 And of course Elise is a world class swimmer who will be trying out for a spot on the Ladera Liquids soon. When Grandma J takes the grandkids to the hotel for a sleepover without parental interference, they traditionally get there buns powdered. Princess Elise wanted her piggies powdered too.....and her wish was granted. Grandma J. is the funnest, coolest grandma there is, and she has a princess for a granddaughter. It is good to be Elise!!!! I love that she is so active...I bet she liked her toy even if it was a boy toy. She'll appreciate it one day!! Powdered toes? That's a new one. Elise has the prettiest eyes! Glad you two got to pamper yourselves and glad you took lots of photos for your scrapbook and to share with us. Precious memories for sure! What's the proper powder for powdering one's toes? You are a great grandma! Those kids will have wonderful memories of you when they are old and grey. love the dance lessons that look the same with different shoes. that's funny!! What's the phone number to rent a kid? a princess indeed with eyes to die for!